Last season, the lion's share of Lunar's efforts went into improving the Lexon, luxury Clubman and twin-axle Delta ranges, so for 2014, it's all about the mid-market Quasar. This model now mirrors the much more attractive aerodynamic front end and flat roof of Lunar's more expensive ranges, plus it comes with its own package of equipment improvements. This Quasar 564 is new for 2014. It's an open-plan, four-berth caravan with an end washroom and separate shower, and with an MTPLM of 1350kg, it is a good match for the likes of a VW Passat Estate. But that's not all. For years, Lunar's reputation for producing the lightest touring caravans in the UK won it extra market share. In recent seasons, however, the gap has narrowed between its vans and those of its competitors, which have driven weights down, as Lunar introduced larger bodyshells. So for the 2014 touring season, Lunar is reclaiming centre stage on lightweights, with a new wallboard that reduces the weight of the largest vans by up to 60kg. The company calls its new approach to construction 'Core', in which the traditional plywood inner wall is replaced by a material called ThermHex – a super-light, plastic-skinned board with a polypropylene honeycomb core. It's covered with the usual decorative PVC, so the only visual clue is the single horizontal board joint, made possible by its large sheet size. According to Lunar, the strength and durability of the new construction have already been proven by simulated life testing on track, in co-operation with chassis supplier Al-Ko. The Quasar has one-piece aluminium-skinned sidewalls, a new moulded rear panel, a colour-coded awning rail and alloy wheels. It gets an appealing new circular graphics treatment in blue, which helps differentiate it from Lunar’s other ranges on the forecourt. 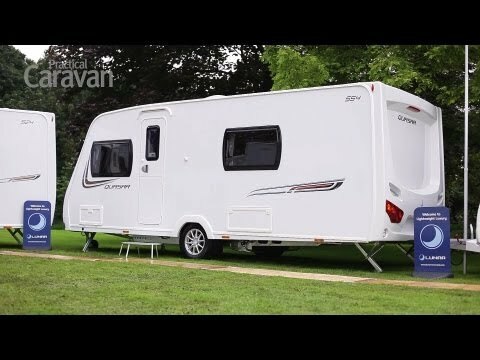 Towing, pitching and setting up should be easy with such a light, slim caravan. The overall width stays at 2.16m, while headroom remains 1.91m. These dimensions help the Quasar keep its low-weight crown, but that headroom is 4-5cm less than the industry norm. There’s an external battery locker, a storage locker with 240V socket, and a step-on hitch cover for easier cleaning. The cantilevered gas locker door of the pricier ranges has been replaced with a simpler conventional hinge with gas strut support. Lunar says all ranges will be prepared for roof-mounted solar panels as a dealer-fit option, and all will have European Whole Vehicle Type Approval. In addition, on the technical side, there’s a new, easier-to-use Truma Combi control panel and LED lighting. The door locks are high-security and the windows have push-button locks. Inside, there’s a pair of facing sofas up front, a central kitchen, a nearside U-shaped dinette and a full-width rear washroom. The twin lounge layout makes dining at both ends of the caravan possible, and as anyone with children knows, those separate lounges can be important for the sanity of families on site during an evening. One interesting feature is that the U-part of the rear dinette is removable. Drop in the free-standing table and you can seat four here at mealtimes. If you’d prefer a rear fixed-bed to the rear lounge, the Quasar 544 shares the same basic floor plan. The cream-accented furniture doors combine elegantly with the light-grey ‘Romano’ fabric scheme, which has attractive mauve contrasts. Nevertheless, it’s dark enough to hide the marks of grubby fingers without dimming the overall ambience. If anything, the luxurious interior challenges the more expensive Lexon. Lighting is courtesy of LED spot, ceiling and corner lights. Truma’s dual-fuel space heater means you don’t have space taken up by a space heater ‘fire frontage’. We also like the Truma control panel – new for 2014 – which is controlled via a rotary knob rather than a touch screen. The kitchen’s gloss-black circular sink and fridge door with cream detailing look classy. These and the cream locker doors help differentiate this space from the rest of the van. There’s now a wipe-clean splashback, an attractive tap and a standard-fit microwave sited sensibly below eye-level lockers. The Thetford hob has three gas burners and an electric hotplate, plus a separate grill and oven. We’d have preferred more work surface or an extension, though. One of the real strengths of this floor plan is its full-width rear washroom with large, fully lined walk-in shower cubicle and ‘Ecocamel’ showerhead. The swivel-seat toilet gets ample legroom around it. There’s also reasonable space to store toiletries in the cabinet beneath the deep basin, a mirror above the basin and several hooks for clothes. The rear lounge sofa can be made into a large double bed. Configured as single beds, the front lounge will only work for very small children, but the sofas here can work as a large double bed across the width of the caravan. As such, this isn’t really for families with offspring who are no longer prepared to share a bed. While it lacks a fashionable sunroof, the Lunar Quasar 564 does offer more overhead lockers. Storage under the front seats is easy to access, thanks to full-length, drop-down flaps, and aluminium-framed and hinged lids on the seat boxes. For 2014, Lunar's Quasar 564 offers a sensible layout for a young family of four, with separate lounge areas that allow you to put a bit of space between parents and children of an evening. What's more, it has the styling spot on, inside and out.